I was beginning to think they just didn’t have broccoli in Israel. It turns out that’s just my American mindset, so accustomed to getting whatever produce I want any time of year. Imagine the concept of seasonality. Here, it’s not just a concept, something farmers’ markets try to convince you of, it’s a complete and total reality. If something is not in season, for the most part we just don’t eat it. When forced to actually eat this way, it really is an entire shift in the way you think about food. The point is, for this post anyway, that broccoli is in season. 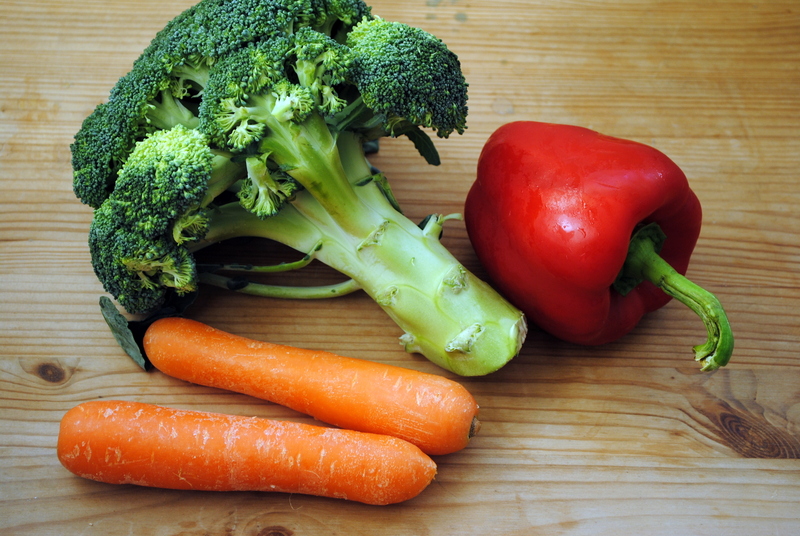 It’s at the supermarket and the shuk, and as one of our favorite vegetables, you’ll be seeing a lot of it. Our favorite way to enjoy broccoli is tossing it with some olive oil and salt and roasting it until slightly browned. 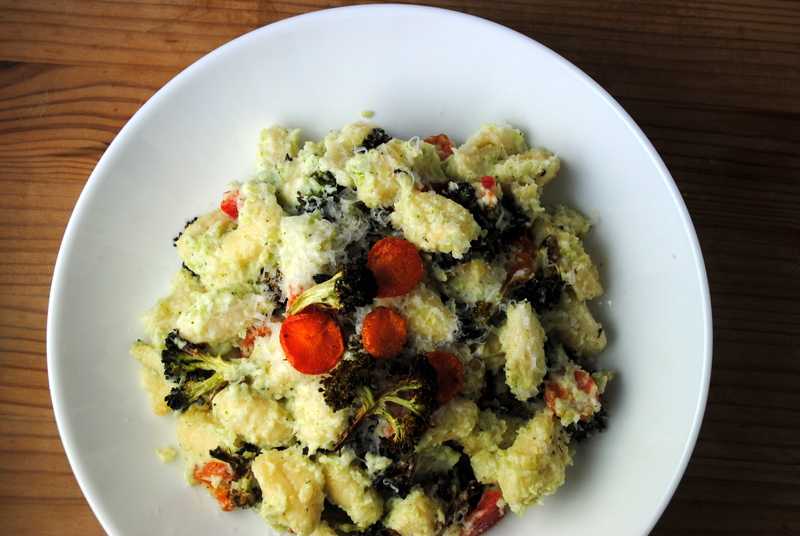 Top it with a light dusting of grated Parmesan and it’s one of the best foods on earth. Slightly nutty, chewy, and downright delicious. I wanted to incorporate that flavor into a pasta dish and also had tons of carrots so roasted them together along with half a red pepper for a nice mix of earthy and sweet. My stroke of genius, I believe, came in blanching the broccoli stems, so often discarded. These fibrous ends are perfectly good and quite good for you. I pureed them in a food processor until almost smooth and then mixed with mascarpone to create a decadent, creamy broccoli sauce. Yum! It reminded me of a similar spinach-ricotta mixture that would come on penne at our favorite, now sadly defunct, Italian restaurant, Sapore. 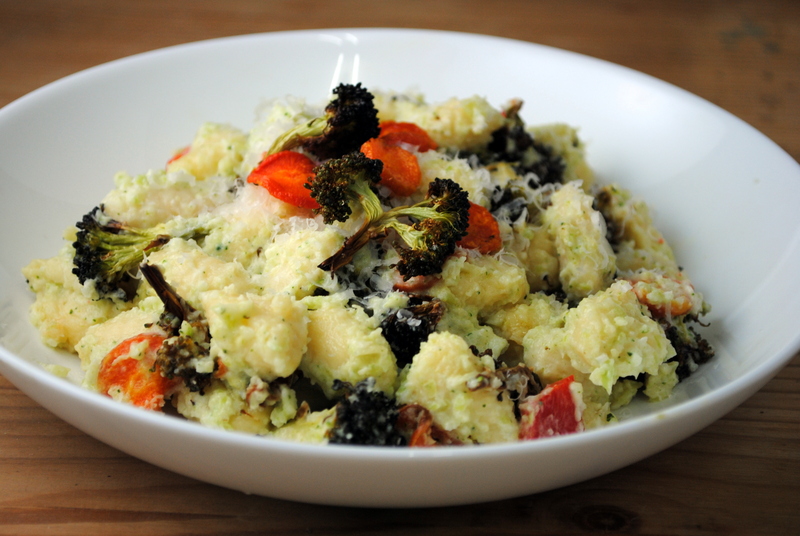 I had fresh gnocchi in my freezer so used that, but I think something sturdier like penne or even spaghetti would be an even better vehicle for the thick broccoli and mascarpone. Really You can just make the sauce and omit the other roasted vegetables, but they do add some nice texture. Preheat the broiler. Spread the broccoli florets and carrot slices on a large baking sheet. Drizzle with oil and sprinkle with salt and toss to combine. 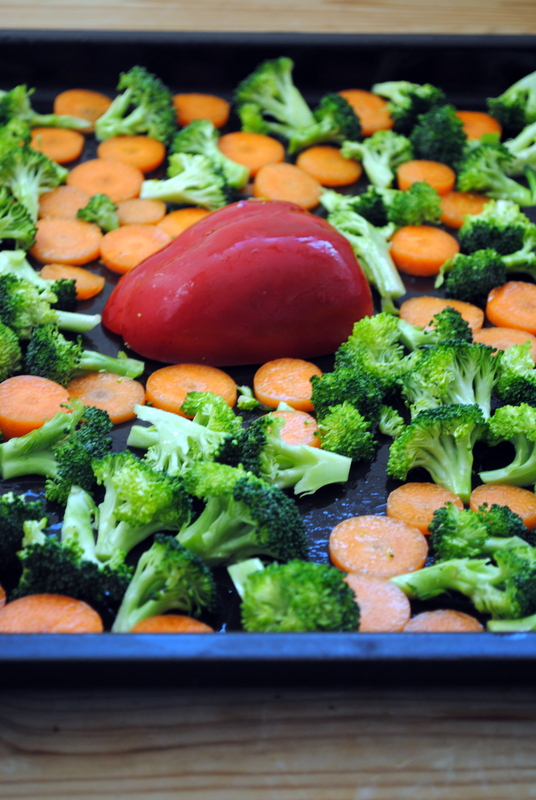 Arrange the vegetables in a single layer and put the red pepper half, open side down, on the sheet. Wrap the garlic in tin foil. Put the vegetables and garlic in the oven and broil until lightly browned (check often all broilers are different, and while this took me 45 minutes it will probably take you less than 15). Flip the carrots and broccoli when halfway done. Remove from the oven. Put the red paper in a paper bag or wrap in paper towels and allow to sit for a few minutes before rubbing the skin off. Slice and set aside. Blanch the reserved broccoli stems (and a few raw florets if you like) in boiling water until tender. Drain and immediately run cold water over (this helps preserve its vibrant green color). Puree in a food processor until smooth, adding some water if necessary. Allow to cool and mix with the mascarpone. Cook the pasta in salted boiling water until al dente. Drain and transfer to a large bowl. Toss with the broccoli mascarpone mixture. Add the roasted vegetables and garlic (removed from its skin). Top with freshly grated Parmesan and season with salt and pepper. Serve immediately. This is amazing! I have all of these ingredients at home (except for the mascarpone) and will be making this post-haste. Do you have to take the skin off of the red pepper? Oh yay! The mascarpone really does make the dish. Ricotta would also be really good! You don’t have to take the skin off the red pepper, I think it’s mostly a texture thing. Just made it–fantastic! Any tips for removing the skins from the roasted garlic? I just squeezed each clove like a pastry bag. But I burned my fingers. Oh yay! Unfortunately, that’s the best way to get the roasted garlic out from its skin. Ideally you’re supposed to let them cool slightly, but that timing rarely works out for me. So glad you enjoyed it!